Good waves in protected spots across the South West yesterday with the swell holding around 4-5ft most of the day, fun and around 2ft in Mandurah and a little mixed in Perth. Today onshore winds and building windswells are breaking across all locations as a deep and powerful mid-latitude low sitting off the South West interferes with us. The low currently sitting off our South West is a touch stronger than forecast on Monday and we'll see a fetch of strong to gale-force S/SW winds projected into the South West this evening, producing a large spike in stormy swell early tomorrow, easing off steadily through the day. The South West should ease back from 6-8ft out of the S/SW, with Mandurah easing from 3ft, and 2-3ft in Perth. Winds will remain onshore though and fresh out of the S/SW. Friday will be much cleaner and with a new building SW groundswell under a morning SE offshore (E/SE further north). This swell has been generated by a strong polar low that developed in the Heard Island region Sunday evening and we should see it filling in through Friday, building to a good 6ft+ across the South West into the afternoon/evening, 2ft+ in Mandurah and 1-2ft in Perth. The swell will ease through Saturday and winds will revert back to the S/SE, possibly tending SE for a period in the morning across the South West, so stick to protected spots. As touched on last update, fun levels of mid-period SW swell are due from Sunday through mid-next week as a series of broad though not overly strong frontal systems project up towards the South West and then under the country under the effects of the Long Wave Trough. The first pulse of swell should reach 6ft through Sunday afternoon across the South West, 2ft in Mandurah and 1-2ft in Perth with a morning E/SE offshore. A slight drop should be seen Monday though with good SE offshore winds again ahead of reinforcing pulse Tuesday to 4-5ft in Margs, 1-2ft in Mandurah, tiny in Perth. 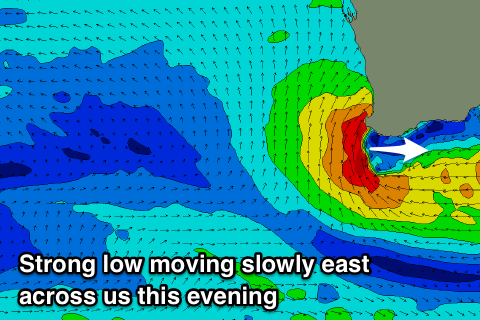 The swells are due to ease from Wednesday with a good morning offshore, smaller Thursday as S/SE winds kick in. Looking to our north and an area of convection north of Broome is expected to form into a tropical cyclone over the coming 24-48 hours, deepening significantly as it slowly tracks west-southwest. This will generate swell for the North West and Indonesia through the weekend and early next week, but its track once it clears Exmouth and moves into our swell window is unknown at this stage. Most models have it continuing west while weakening, with some small and inconsistent NW groundswell possible mid-late week. Nothing to get excited about at all yet. Check back Friday for an update. How come the forecast doesn't line up with these notes? Let’s start the north swell hype now shall we?! Hype! Hype! Hype! Hence the playing down ;) Already seen local surfers starting to get a little over excited. "Small and inconsistent NW groundswell possible mid-late week. Nothing to get excited about at all yet." Pack the bags Marge, we're moving west. I gotta get me some of that small and inconsistent surf. The forecast says 3-4ft Friday through Monday where these notes say it's going to be 6ft? Ah yes, for longer-range, long-period swells the Margs forecast locations under-represents the size. Somethine we'll look to fix soon. It's not great for Indo, more so mid-period and windswelly. Also gone by late next week. Parts of the Kimberly get quite good one break turns red with pindan backwash.